Day 15 of Scottish season 15/16. 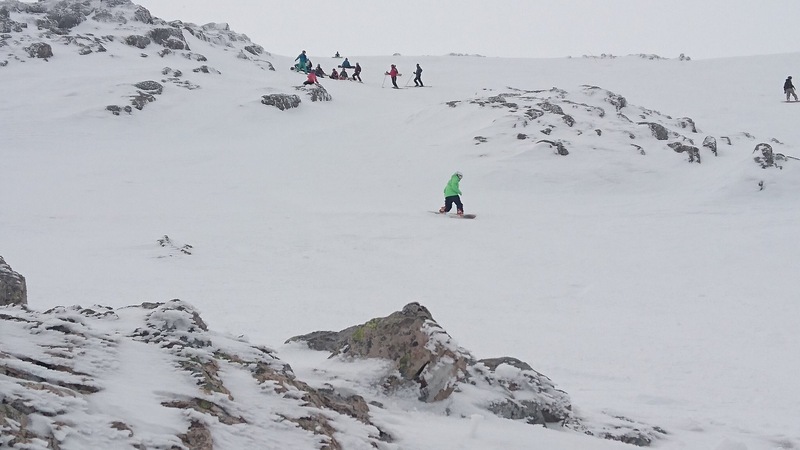 Today was the day for the Glencoe Freeride Clinic. It started once again in bright sunshine and conditions looked epic. Loads of cover and great visibility. The group of skiers and snowboarders congregated at the top of the access lift for 9:20 and we introduced ourselves and shared our experiences on snow. The clinic would be a coaching session with no direct criticism, more pointers and suggestions with feedback and self assessment, “how do you think you did?”, that kind of thing. This was good, as that’s what is needed when you are on your own trying to improve. We took the lift up to the summit and down Happy Valley and the Wall while the coaches had a look at our individual riding styles. Back at the top we were reminded about dynamic body posture, knees bent and upper body poised yet relaxed. On top of this Robbie, our snowboard coach explained fore and aft movement. Shifting weight forward while initiating a turn and moving back through the turn towards the tail. After we try out the techniques we explain how it felt and whether it worked for us. Next up was rolling the feet. When initiating a turn, the lead foot should roll towards the tip of the board and when finishing the turn both feet should be rolled outward. This pushes the knees out while keeping everything aligned properly. It took a few turns, but coach did say it improved leg movement on my turns. Once again we are reminded about dynamic body posture, just to keep it at the fore front of our minds. We were then asked to think about picking lines. Trying to be more creative, choose a path through rocks for example. Talk to your riding buddies, swap ideas. Simple ideas that can add so much to your riding experience. We stopped for lunch after another run down the wall, following Robbie through some icy rock patches at the top before dropping into the transceiver park. The weather was starting to turn, getting colder and cloudier with small flurries of snow. The coaches took things up to the to The Spring Run where we would take our newly learned techniques to the steeper slopes. Once we got down to the flatter plateau area, we practiced ollies. Shifting weight over the nose of your board, then back and pressuring the tail to pop you up. The trick , which may take a while, is to look way ahead and keep your upper body straight and head up. Not to hunch over. This was not just a technique to help you get some air. The rolling fore and aft motion is exaggerated here and helps with general turning action. Returning to the top of Spring Run we discussed the idea of spraying snow on your toe side edge. This gets your body low while turning, but angling your upper body upward with your head looking up, arching your back. This aligns your weight over your toe edge more giving more pressure and control. 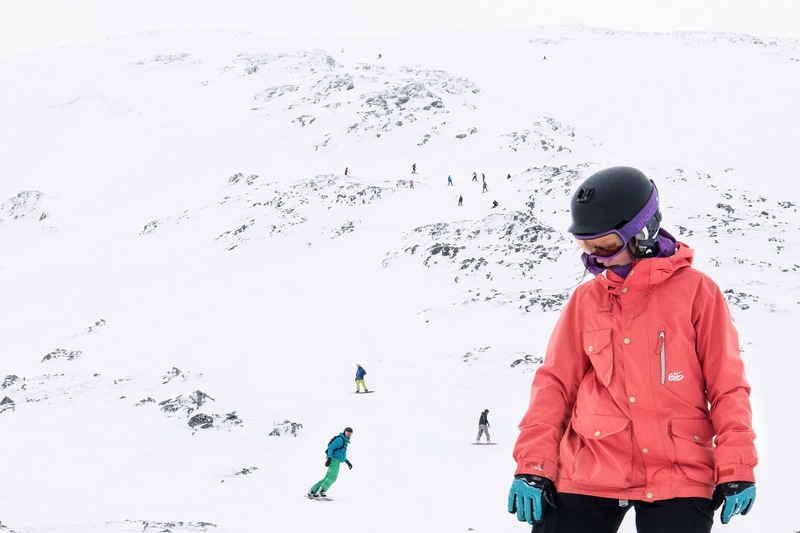 We tried this out and I found it really helped with the following turn, setting me up nicely to move onto my heel side on the steeper slopes. We had a final run down the Low Road practicing spraying snow and ollies, and finally in a huddle at the access chair, Robbie our coach gave us a final assessment. Without being too critical he commented that I have a strong riding style, but I could work on relaxing my shoulders and loosening up the whole upper body. Class dismissed, and with a few of the remaining classmates, we ripped up a few last runs including the canyon before the lifts stopped running and we had to say our goodbyes. 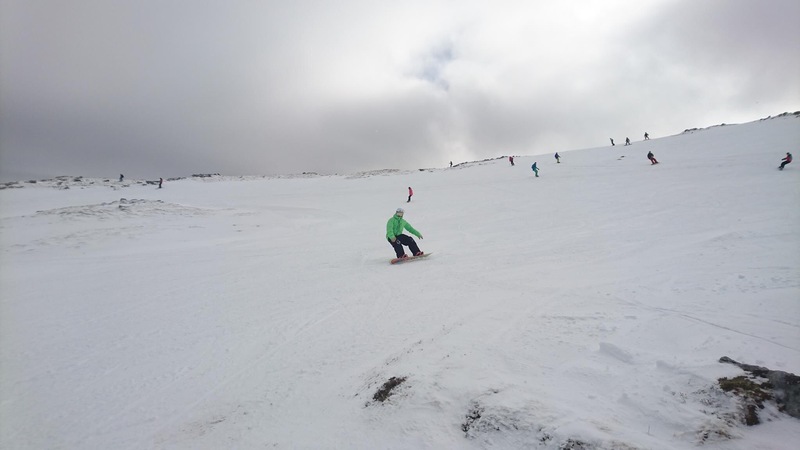 They plan to continue the Freeride Clinics and it was well worth the £45 it costs and as well as coming away with ideas and tips you get to meet a great bunch of like-minded people. Our group was quite varied, old (me), younger, female, male, experienced and less experienced. The structure means there is no pressure to keep up or compete. I thoroughly recommend it, no matter how good you think you are, there is always something new to learn. Who knows, maybe next time they’ll get me riding switch comfortably! 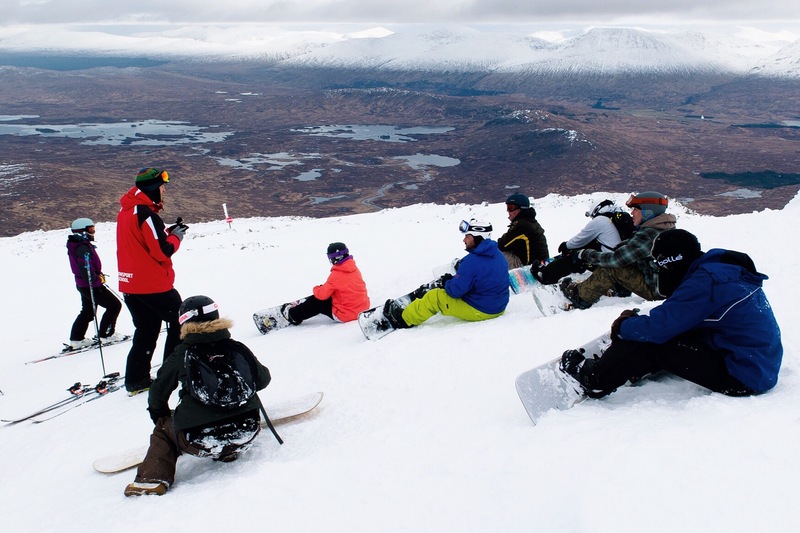 A big thanks to Glencoe and the snowsports coaches Jake and Robbie. Make sure you follow Glencoe Mountain Resort on Facebook for notification of future clinics and take part!